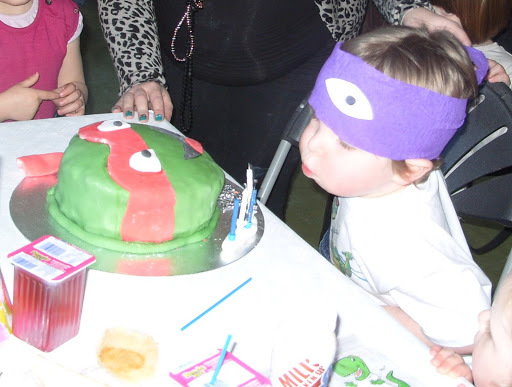 I’ve just spent this evening debating what to do with the helium balloons left over from eldest’s Birthday earlier this month and realised I still needed to edit photographs so in the spirit of blogging my life I decided to do my first proper blog on his special Day. So, he’s been Ben10 mad for 18 months now and was determined he wanted a Ben10 party featuring all his favourite characters. He’d started planning it the minute his last Birthday had been and gone (Pirate themed) and had been asking to go on the laptop to look at cakes. 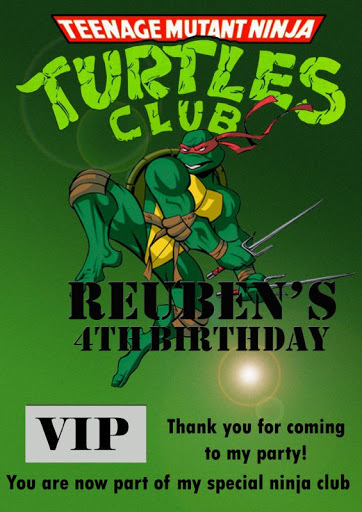 Then, one day, just after Christmas, I spotted Teenage Mutant Ninja Turtles was being shown on TV and it made me feel all nostalgic – unfortunately, this led to a new obsession and I ended up having to organise a rather retro party. 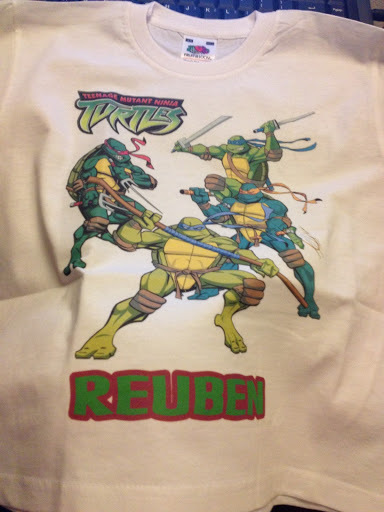 So, what do you do when you can’t actually get official (or unofficial for that matter) merchandise unless you import from the US and pay a fortune? Well you craft it obviously! Pinterest helped here quite a lot but the collage above is a little peek at what I did. We’re moving to a different town over the next couple of months so I wanted him to have a party with all of his friends meaning I was organising a do for 35 children. Not a small feat. I booked the local leisure centre as they have a bouncy castle, sports equipment and then another room for food and games. Feeding that many children meant my tight budget was going through the roof so I decided to do a little lunch bag for each child instead. I was amazed by how cheap this was. I ordered the green bags from eBay and spent an evening cutting out bandanas from crepe paper and gluing on with a marker pen smile. I filled them with a sandwich, some chocolate fingers, raisins, a yoghurt and a cake I’d baked with a topper again from eBay. The party bags consisted of a cellophane bag jam packed with sweeties and a VIP badge with a wonderful insert made by a really good friend and Godparent to my daughter. I wasn’t sure how well they’d go down but the children loved them and wore them straight away. The Birthday Boy was still wearing his days later. 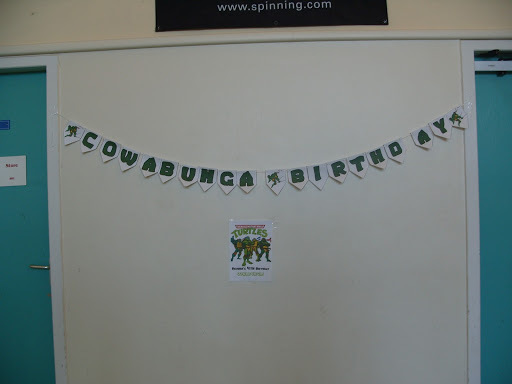 She also made me some brilliant posters and some Cowabunga bunting. Unfortunately I was running around like a headless chicken all day and my DSLR is missing in action so you’ll have to forgive some of these photographs. The balloons were just 4 helium ones with crepe paper bandanas and eyes glued on. 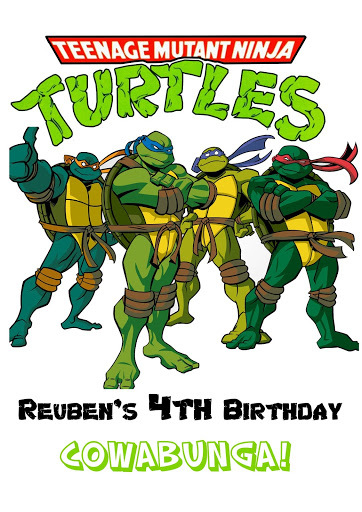 They lost their bandanas fairly quickly and the Birthday Boy and some of his friends ran around with them on their heads instead. The cake let me down a little, I was feeling tired and quite nauseous from my bump so threw it together as quick as I could. He was happy with it though and really, that’s all that counts. I also got a lovely personalised t shirt that I ended up having to handwash each night for the week so he could wear it every day. 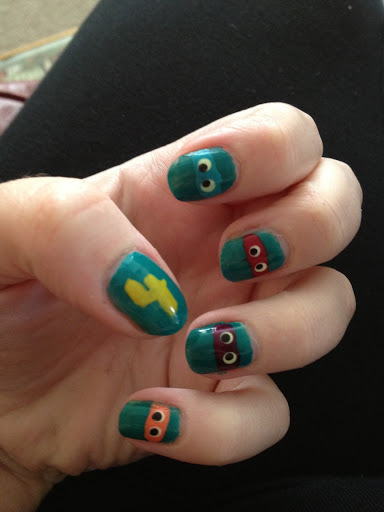 My final touch was some TMNT nails as requested by the Birthday Boy himself, I forgot all about doing these and ended up remembering at 1am so quickly slapping some polish on. He’s requested I do them on him soon. Finally, a list of all the wonderful eBay shops where I purchased a lot of my party supplies. I’d normally try and go for local but I left it to the last minute, I can’t believe how fast they all delivered and that everything was such high quality so I’m more than happy to link them all up here. Oh, and one very last thing. I went to a small Church craft fair today and bumped into some lovely Ladies from BC Crafts and they had the most amazing Ninja Turtle. Unfortunately it was Michaelangelo, had it been Raphael and I’ve snapped it up! I hope they don’t mind me sharing their photograph here as I’m going to double check with The Boy which one he definitely wants and get one ordered. I’m wondering if they can work on a Shredder to complete the collection.